We recently helped a reader resolve a £1500 debt that was being pursued by Sheffield City Council. Not only did the reader dispute owing the debt, but Sheffield City Council refused to submit any statement of accounts or court judgment to prove the debt was owed. Worst of all, the debt was over ten years old. As you would expect from the vegetables that work for the local council, no matter how hard the complainant appealed or denied owing such a debt, the council insisted that the burden of proof that the debt was not owed fell upon her shoulders. So we wrote to Sheffield Council on her behalf asking them to clarify a few facts of law. Our letter is set out below for anyone who may have a need for it. But what’s important to know is which portion of it had the desired effect. I am in receipt of your letter dated 26th September 2014 in which you make threat of bailiff action in response to an alleged debt of £1,446.61. 1) I have made repeated contact with Sheffield City Council in relation to my dispute concerning this matter. They have been entirely uncooperative and unhelpful throughout, insisting that the burden of proof that I am not liable for this debt remains solely upon me. 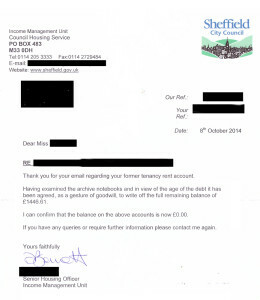 Unless Sheffield City Council or their collection agents can submit proof of account records, invoices or statements (which have been repeatedly requested) in relation to this debt then this dispute will remain unresolved. 2) No summons in relation to court proceedings were ever received by myself. If they had, I would have attended the court to dispute the alleged debt. I would ask that you forward me a copy of the judgment and/or warrant against my name or any corresponding court identification or reference numbers. If such a judgement exists and proves to be valid I will contact the issuing court and ask the judgement be set aside due to the initial summons never having been received. 3) The debt you are pursuing is over 10 years old. Please submit any recent court documents or legal authority that proves that you are not attempting to collect a debt that is statute barred and contrary to the Limitations Act 1980. 4) The ongoing failure and refusal of Sheffield City Council to settle this dispute via amicable means is a breach of your duty of care. Your attempts to collect this debt, contrary to the points outlined in this letter are causing me considerable alarm and distress, and are an interference of my rights to privacy and a family life. Any further unwanted letters of demand, bailiff visits or threats of any kind from Sheffield City Council and it’s enforcement agents will be considered harassment. If they continue I will not hesitate to seek remedy via the civil courts for an injunction against you as well as compensation for the time I have wasted dealing with this issue. Although Sheffield council are unlikely to find their own arses with a compass, let alone find a statement of account dating back over ten years, it’s the age of the debt that’s significant. The Limitation Act 1980 prohibits the recovery of debts over 6 years old (from the first day the debt incurred). Just as long as the customer has not acknowledged owing the debt in writing or by making a payment during that limitation period. 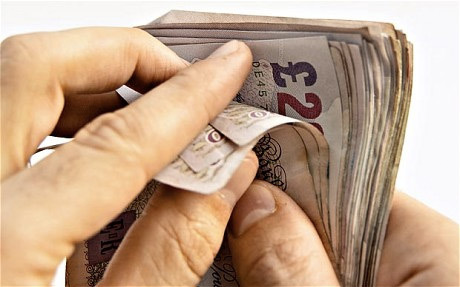 And it doesn’t matter if the creditor or local authority has obtained a county court judgement either, as long as the debtor hasn’t written to the creditor or made a payment within those six years then the debt is a write-off and cannot be collected. This doesn’t mean that the creditor will give up altogether. They may still write letters and persist with empty threats, phone calls and impotent debt collectors, (see our zapper letter for eradicating unwanted debt collectors) but they will be unable to obtain any further court orders or warrants (or use any existing ones) to pursue the debt. And attempting to use bailiffs to recover the debt – as Sheffield Council were threatening to do in this instance – would be unlawful. The only caveat is that the statute of limitations does not apply to EVERY type of debt. There is currently NO time limit on collecting debts for income tax or duty. And Child Support and Child Maintenance debts are embroiled in a complex set of rules that may need an accountant or a Nasa scientist to explain. Putting it in it’s simplest legal terms, the general rule, when being hounded for debts that are over six years old is to write back to the creditor and tell them to stuff it up their arse. For more information on statute barred debts take a look at this helpful factsheet prepared by the National Debtline.